Ever wanted to build your own Castle, Go Kart, Robot or Creature and more? In this room you will be given the opportunity. All objects are simple, light weight and can be built in numerous ways. Use your imagination and ask your friends to help. You can even have a ride or climb inside when you’re done! To disassemble and construct various objects such as a Go Kart, Castle etc from light weight materials provided. No tools are required as parts are designed to be interlocking and fitted together by hand. Objects are life size and can be sat in or stood in when completed. To reduce risk of injury all objects are low level/single storey and cannot be moved or used outside their immediate construction area. No lifting or climbing apparatus are required for construction purposes and materials are lightweight pre-fabricated sections. Children can test their imagination and creativity by re-building the "creature" into a ride-on future bike or an amazing abstract art piece or whatever they desire. Children can build a normal or funny robot by screwing his arms into his eyes, his hands into his ears or his ears into his arms! They can remove his entire body and build a "mini-bot" or they can mix pieces with the creature to really test their imagination. 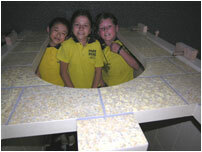 The castle is a challenge for older children and teachers or mums and dads. It can be pulled apart and reconstructed in different ways. Trying to complete the castle with all walls properly fitted is a real test of intelligence, perserverance and team work.